Mention Clough Williams-Ellis (later Sir) and most people immediately think of Portmeirion - the holiday village he designed, which became famous after the television series, "The Prisoner". It's now a well-known holiday resort on the Welsh coast with fine gardens, but there's little chance of getting away from the crowds here - it is after all, a place that people go to spend their hard-earned vacation time. 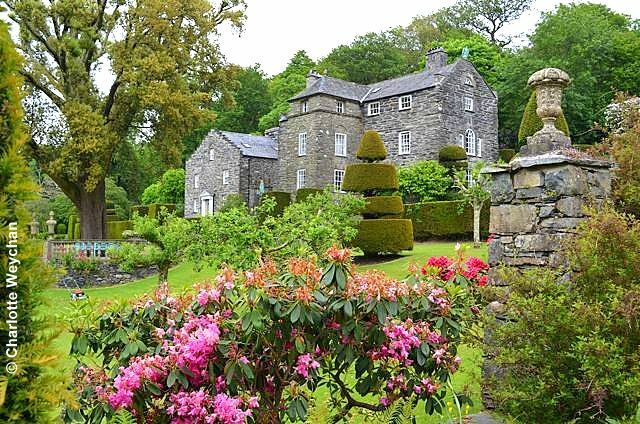 But drive just a few miles inland to Llanfrothen and you'll find Plas Brondanw, which has all the Williams-Ellis hallmarks, without the tourists - an enchanted garden with magnificent views over Snowdonia. 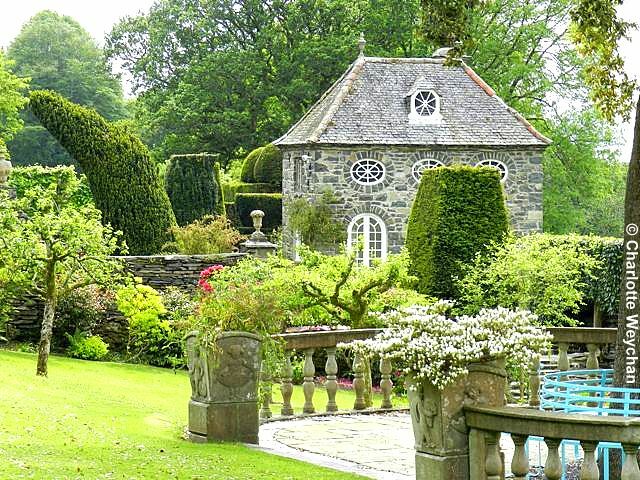 The 17th century house that sits at the heart of the garden (above) was bequeathed to Clough Williams-Ellis in 1908 when he was just 19 years old. It had been abandoned by his family and he spent many years of his life struggling to pay the bills here whilst restoring the property. He also set to work creating a formal garden (when his finances permitted), making use of strong topiary axes and sculpture to give the garden a personality of its own. 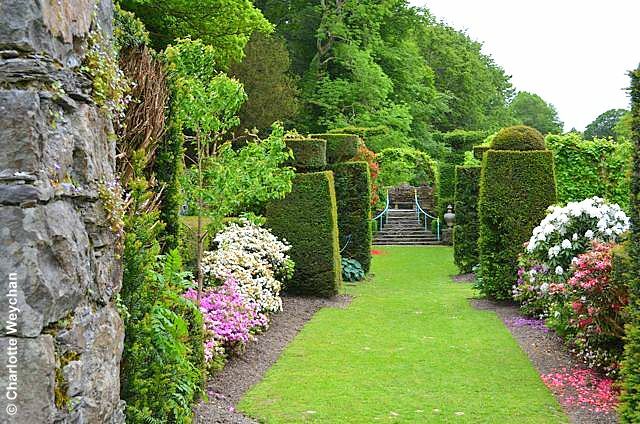 There are no flowers to speak of here and it's the Italianate terraces and topiary that make this garden unusual. However, rhododendrons and azaleas give great splashes of colour in springtime. The garden at Plas Brondanw has been designed to take full advantage of the fantastic views it enjoys over Snowdonia, famous for its dramatic peaks. The strong garden lines created by Ellis-Williams mean that your eye is naturally drawn to the mountains around the property, which are framed by the topiary walks, or viewed from the terraces. Add to this the lack of crowds and this garden is a treat. 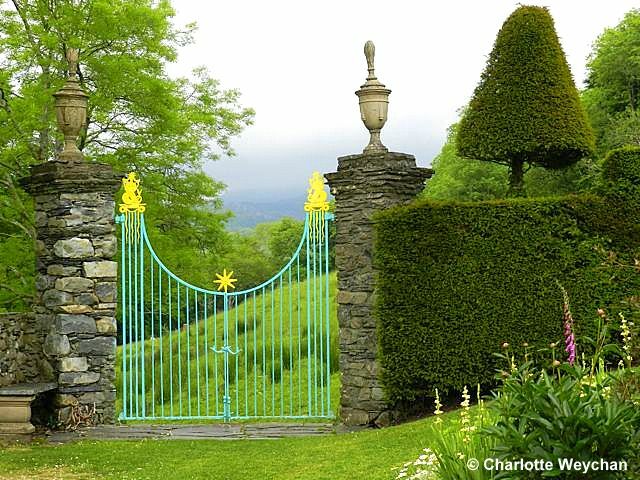 Distinctive or quirky (depending on how you interpret) blue and yellow fencing and gates add to the sense of the sublime here. Well-known neighbouring gardens include Bodnant, which I'll be reviewing later this week, although you'll find yourself doing battles with the coach party crowds there. Plas Brondanw is open daily from 9.00-5.00 throughout the year. It has a small cafe (tuna melt particularly recommended!). Recommended reading for future forays into Wales is "Discovering Welsh Gardens", with fantastic photographs by Charles Hawes, who really captures the spirit of Plas Brondanw, as well as 11 more gardens in Wales. I wish I could take more then 3 month's off from work to visit all these beautiful garden you are showing. Thanks a lot for sharing all this beauty. It looks lovely. All beautiful stone and crisp topiary. Definitely one I'd like to see if I'm in the area. The photos are terrific Charlotte! Don't you love the gate? It's more like an invitation than a means of keeping one out. Charlotte, Plas Brondanw seems to have a character unlike anywhere else. I like the lack of flowers, its wonderful setting, the stonework, and especially the blue and yellow paintwork. Thamkyou for the revelation. You've taken some great shots here Lottie! !and thank you for your kind plug for my book (actually there are 19 other gardens featured). But you know I do think your followers might get some shocks if they visit that you might have prepared them for. Another spectacular garden Charlotte! Thanks for sharing! Many thanks for listing the book, as I will be near Wales in September this year. I am sure to find a lovely garden not too far from Shropshire in it.